Harvard scientists and engineers have developed a new type of battery that could allow the supply of energy from renewable sources such as wind and solar to be far more reliable and economical and transform the way electricity is stored on the grid. The new metal-free ‘organic flow’ battery was developed and tested in a laboratory at the Harvard School of Engineering and Applied Sciences (SEAS) in Cambridge, MA. The team writes about the work in a paper published in Nature recently. The problem with current solid-electrode batteries, such as those in mobile phones and cars, is you can’t separate the energy storage from the power conversion hardware – they are packed into a single unit. The result is they can’t run at peak discharge for more than about an hour before being drained. This is not a good way to back up renewable energy like solar and wind, which is intermittent. By contrast, flow batteries store energy in the electrochemistry of fluids contained in external tanks, which are separate from the conversion hardware. This means they can be independently sized – the amount of energy stored is thus only limited by the size of the storage tank. This permits larger amounts of energy to be stored at lower cost than in traditional batteries. For example, to store 50 hours of energy from a 1 megawatt wind turbine you could use traditional batteries with 50 megawatt-hours of energy storage, but they’d come with 50 megawatts of power capacity. It doesn’t make sense to pay for 50 megawatt power capacity when you only need 1 megawatt. 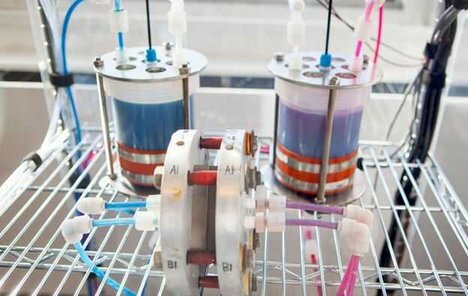 The development of flow battery technology, has until now been hampered by the lack of cost-effective materials. Current types of flow batteries use expensive metals as the active components of electrolytes, for example vanadium and platinum. Michael J. Aziz with the prototype metal-free flow battery. Now Prof. Aziz and colleagues have designed and tested a flow battery using a non-metal material called quinone. They say their flow battery doesn’t require expensive precious metal electrocatalysts, and performs as well as vanadium-based flow batteries. Quinones are an abundant family of organic or carbon-based molecules found in crude oil and green plants – they are not unlike the molecules that store energy in plants and animals. To find just the right quinone for the battery, the researchers used a high-throughput molecular screening method pioneered by co-author Alán Aspuru-Guzik, Professor of Chemistry and Chemical Biology at Harvard. The technology allowed them to calculate and sift through the electrochemical properties of over 10,000 quinone molecules. To back up a commercial wind turbine, the flow-battery would need a large storage tank, possibly in a below-grade basement, say the researchers. If you had a large field of turbines or solar panels, then you would probably have a few very large storage tanks. There is no reason why the same technology could not be useful for consumers too, they add. You could have a tank about the same size as a tank for heating oil in your basement. This could store a day’s worth of solar power from roof panels, which could provide enough power for later as the sun goes down, through to the next morning, without having to burn any fossil fuels. 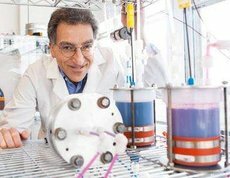 A prototype flow battery in Aziz’s lab (Photo: Harvard). He also wants to improve the underlying chemistry of the battery, and they have a number of ideas that could lead to huge improvements, he says. Connecticut-based Sustainable Innovations, LLC, a collaborator on the project, expects to be demonstrating the organic flow battery in a unit about the size of a horse trailer in about three years. Such a portable unit could be hooked up to solar panels on the roof of a commercial building, allowing solar energy either to be used directly or stored for later, as demand requires. Some of the funds for the project came from the Department of Energy’s Advanced Research Project Agency–Energy (ARPA-E).